Pair fall color with a town worth at least one overnight stay and a drive that is scenic any time of year. 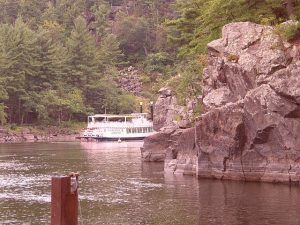 A fun getaway is to drive along the St Croix National Scenic Waterway and Lake Superior’s North Shore after first starting in Stillwater, MI. Overlooking the St. Croix River on the Minnesota side of a waterway that also borders Wisconsin, Stillwater has several historic B and B’s, antique shops and cafes. I stayed at the Rivertown Inn for its romantic rooms, great breakfasts and charming hosts. However, there are several other good B&Bs. A good way to see color from the town is a paddle boat excursion. When ready to look for a long color drive, head north on Highway 95 to follow the St. Croix National Scenic Riverway. Both sides of the highway are state parks. The scenic byway goes from Point Douglas near Hastings to north of Sandstone, MN. 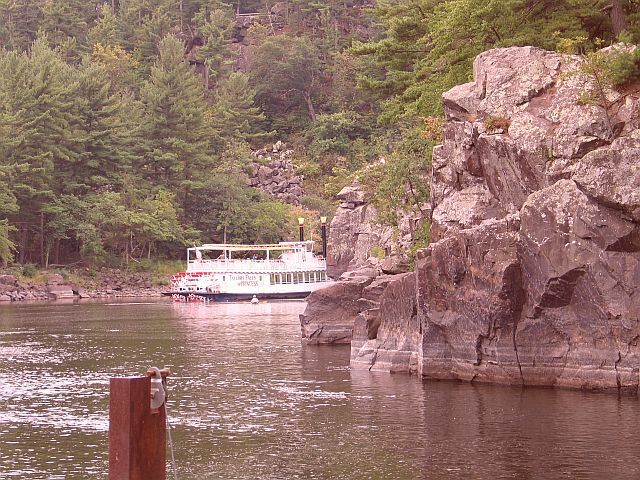 If you didn’t take a paddle boat in Stillwater you can do so from the Minnesota side of Taylors Falls. From Taylors Falls continue north on M35 and then I 35 to Duluth where you pick up M61 along the North Shore of Lake Superior. The route takes you to Grand Marais. The North Shore is a nationally designated “All American Drive” for its scenic overlooks, fall color, hiking trails and waterfalls. Be sure to make an overnight reservation ahead of time. A fun lodge is the Naniboujou. Or check out the lodges at the William Obrien State Park site. For more information visit Explore Minnesota. Remember to charge the phone because lots of good photos await.